IS THE windmill coming back? With strange, unconventional types, inventors are seeking to adapt it to a modern age. Their experiments may bring new success in man’s effort for 800 years or more to harness the wind for power. Centuries ago, people milled their flour, sawed wood, and pumped water with the picturesque European windmills whose enormous “sails” swept from earth to sky. This country contributed the smaller and more practical narrow-bladed type that pumps water on farms today. A new miniature design shaped like an airplane propeller charges storage batteries for radios and for lighting rural homes. To provide power on a larger scale, giant structures envisioned by modern designers would reach heights where winds constantly blow. One inventor, Hermann Honnef, proposes to mount 500-foot wheels, with spokes that serve as vanes, upon high towers. A single “skyscraper windmill” of this type, he estimates, would generate enough electricity for a city of 100,000 inhabitants. 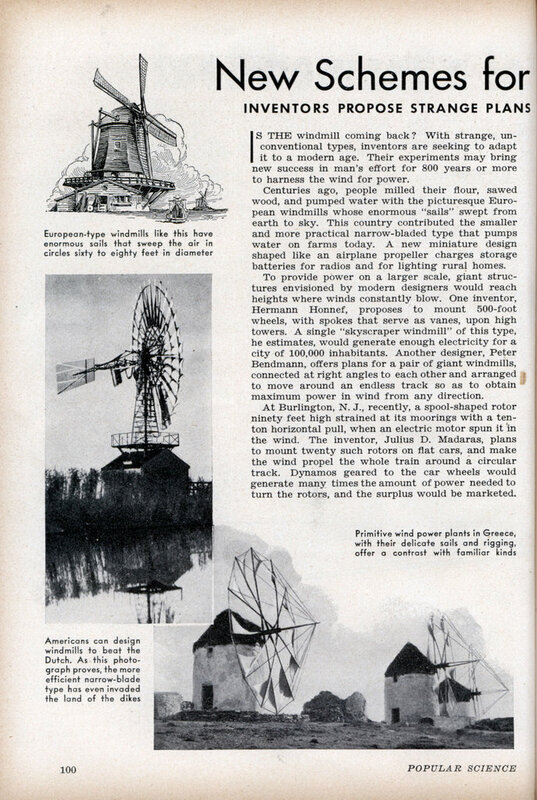 Another designer, Peter Bendmann, offers plans for a pair of giant windmills, connected at right angles to each other and arranged to move around an endless track so as to obtain maximum power in wind from any direction. At Burlington, N. J., recently, a spool-shaped rotor ninety feet high strained at its moorings with a ten-ton horizontal pull, when an electric motor spun it in the wind. The inventor, Julius D. Madaras, plans to mount twenty such rotors on flat cars, and make the wind propel the whole train around a circular track. Dynamos geared to the car wheels would generate many times the amount of power needed to turn the rotors, and the surplus would be marketed.